The SoNo Collection will move ahead without a hotel, Norwalk officials say. NORWALK, Conn. — It’s premature to provide specifics about the changes to The SoNo Collection, Mayor Harry Rilling said Wednesday. “We’ve got documents they have been presented to us so it’s really too early for us to talk about the specifics,” Rilling said. 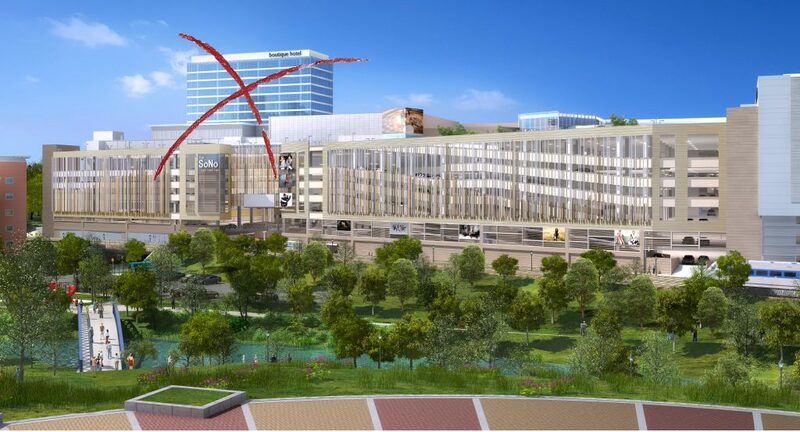 The city on Tuesday release generic info about a deal that has been worked out with GGP (formerly General Growth Properties) to allow the mall development project to move ahead without a hotel component. This includes a $3.5 million payment to the city, in addition to the $550,000 “circulator payment” that was collected last week and the $1,022,500 payment for City easements necessary to get a building permit. GGP Senior Developer Doug Adams said Wednesday that space planned for a hotel will be filled instead with street retail. “We expect the hotel lobby that was at grade to become street retail,” Adams said in an email. The project needs to get new approvals from the Common Council, the Redevelopment Agency and the Zoning Commission. This will result in a series of public meetings; the Council Planning Committee plans to allow public comment at is meeting Monday, to be held at 7 p.m. in City Hall room 231. NancyOnNorwalk on Wednesday asked Rilling and Assistant to the Mayor Laoise King who had attended the meetings in which this deal was negotiated, and if there was any data to show how much property tax the mall would have paid. Minority Leader Shannon O’Toole Giandurco (R-District D) and Council member Michelle Maggio (R-District C) were part of the discussions, he said. NoN asked Adams when he thought construction might begin. How can the public provide input at Monday’s meeting when Rilling says it’s too early to give us any details? Hopefully the CC members can see through the fog here and make an intelligent decision- this is a huge failure for Norwalk. So information on this deal is clearly on a need-to-know basis. Apparently this administration believes the pesky public/taxpayers do not need to know. ..
Clearly the removal of the hotel is a change in the application simply because it’s not feasible, if it were GGP would likely include it. So why subject GGP to months or years of debate about what should be done in lieu of a hotel. How about nothing. Let it alone and let GGP get on with it. Remember, this all started over 2 decades ago with Fred F. French’s 1.0 million SF office complex, then Spinnaker with a similarly sized mix use project that morphed from heavy office to heavy residential. In each case years went by as the developments were revised to meet the new realities only to be dragged out to where fundamentals changed yet again. We have repeated the process with GGP, from their original retail specific project to be inflicted with a City imposed hotel (at the time to least invasive). See the pattern. The market shifted, the hotel is now not feasible, what next? Sadly, if we continue to repeat past mistakes of over control I fear we will run out of time on this commercial real estate cycle. And loose yet another developer, and another decade. Our process is the problem, not the developer. If been promised the information as soon as it is available. @dianeC2, thank you for posting this. The Common Council DOES NOT have to approve this request for a change in the LDA. GGP is entitled to request a change in the LDA, but there is nothing in here to suggest that the CC must approve. It’s absurd that because the developer no longer finds the hotel “feasible” nor office space “feasible” that the citizens and taxpayers of Norwalk have to accept the change. The Common Council must not approve this requested change to the LDA. Donna, sadly, from all the information I am gathering today, it appears this is a done deal. Councilman Kydes has indicated to me that he may not even ask for a vote by his committee tonight, and even if he does and they somehow vote “no” on advancing to full council, he does intend to exercise his discretion to move the item anyway. On the plus side, I just saw a legal notice in Hour announcing the Redevelopment Agency has set a 35-day Public Comment Period regarding this matter. Though even that is lightning speed, and still no mention of a Public Hearing, at least this may buy folks some time before the full Council is actually allowed to vote. By the way, the public may have skimmed over or missed this legal notice entirely, because it doesn’t contain any reference to the words GGP, SoNo Collection, Hotel or Mall! It only names the property owner as the legal name Norwalk Land Development LLC and the property as Reed Putnam Area. One would think that a land use change of this magnitude would be the last thing our elected officials want to deal with in an election year, but it’s quite the opposite. Perhaps they believe their reelection is in jeopardy: if they don’t give in to GGP’s blackmail, then GGP will walk. To which I say “let ’em walk”. This “but the empty hole is an eyesore” and “any development there is better than none” excuse for the $3.5 million ransom is a weak defense by this administration and our council. Taxpayers in Norwalk should consider speaking up and having our elected officials work for US, not every “do it our way or we walk” developer. It takes political courage and personal will to stand up to threats. For heaven’s sake, Mayor Rilling was our longtime Police Chief…surely he recognizes when a developer is holding our city hostage…. Thanks for the information, Diane. 35 days is hardly enough time to mobilize the public to oppose the change in application. Also things that should never even make it out of committee seem to fly through the approval process here. The 3.5 milllion dollar fee GGP is willing to pay the City is telltale. Also why are the developers so quiet about how they reached this conclusion regarding feasibility? Will the next change be that Bloomingdales, which is underwater, is no longer a feasible anchor store, so we’re getting another Walmart instead? The City of New York generated almost 2 BILLION dollars in 2015 in fees and fines. Fines alone accounted for almost half that revenue. The installation of cameras to catch red light and bus lane violations accounted for most of the gains. The city collected 150 million in “quality of life” violations (like failure to clean sidewalks) and 565 million in parking tickets. Norwalk doesn’t seem interested in using fines and fees to generate revenue. The city doesn’t staff enough people to enforce the laws already on the books. And yet, with some up front investment in cameras and by adding a few enforcement jobs, Norwalk could generate considerable revenue this way. Instead, our leaders would rather sell our quality of life to the highest short term bidder, and worry about the consequences of abandoned big box stores and malls down the road. Or better yet, let the negative consequences be someone else’s headache. We need a change in zoning to prevent reckless commercial development. Our elected officials are succumbing to the lure of permitting fees and forgetting about long term consequnces. I would support a zoning regulation that forbids new retail development based on the percent of existing vacant retail space. I don’t know what the right formula would be, but between West Ave, Wall Street, Washington Street, Water Street, and Main Street, there are many tens of thousands of square feet of empty retail space. So how will a mall–which is now ADDING even more retail space–benefit the city and those who live here? It just doesn’t add up. Residents need to oppose this change in application. This isn’t the deal the city was promised. Developers don’t build what is not feasible or profitable. To oppose a prudent business decision is not in anyone’s best interest. The profitability of a hotel is a GGP P and not an OP (their problem, not ours). The land was acquired to suit a particular purpose, which included 30% commercial office space. Now the developer, to address their own profitability projections, is trying to not only pull the hotel, but change the LDA. That’s a big ask, not a little one. The CC needs to approach this with sobriety and with an ear to their constituents. Everywhere I turn in Norwalk, I see vacant retail. Washington Street and Water Street have tons of available space. A mall on the 95/7 spot isnt for Norwalk. It’s for Westport, Wilton, New Canaan and Darien–towns with better infrastructures, better schools, excellent amenities and zoned to keep big box stores and shopping malls OUT. Time for Norwalk to follow suit.